Clickbank is known for great digital products, that's why I say the Clickbank, they are providing great platform to make money for promoting digital products and at the same time they are providing great platform to vendors those are creating digital products. Clickbank recently changed their layout with colour of their logo, but this is little bit off information according to the title of this blog post, don't worry I will tell those reasons, why you must promote Clickbank digital products. Then are you ready to know, hey read the article carefully if you wanna really want to know the information about Clickbank. Advertising network paid you about 70% of their total earning even less, but here is the big difference they give you upto 75% of the product selling by you. If you are thinking selling and clicking on the ads is different right, but let me tell you advertisers also selling their product through your blog right, that's why they are promoting their product. Now promote any one of these above products, first go to their affiliate tools, those even I have shared on the article. Now promote any one product and see the difference within one month, if you are earning $400\month from advertisements then you will earn more $1000\month. I am not joking it will happen, just try once and see the difference in earning!!! This is important in the market, if any thing is known for customers then it is quiet easy to sell the product. And Clickbank is known for selling digital product from last few years. Service is most important for internet customers and they are providing great service to their customers as well as affiliates. Most important service for customers is 60 days money back guarantee!! In the internet you have to give more options to customers for better flexibility for the customers and they are providing best possible ways to give payment like Paypal, Credit Card. Well, few days ago I have read on ClickBank blog, that they are going to add more options for making it flexible for customers. If you want to show advertisements on your blog, then you have to wait for the approval from the advertisement networks right. But here is the difference, you don't need to wait for promoting Clickbank products, if you don't even have website or blog even then you can promote Clickbank product quiet easily. As I already told you, don't need your own blog, just you have to give sell no matter how? It is just like amazing give sell and get commission that's it. If you don't need to pay even a single penny to create an account on Clickbank, It's free! But you have to invest to promote a product, if you don't have your own blog or website, because if you will not promote the product then how would you get sell. No sell means no commission, you need to invest only few dollars for this, you may use Bidvertiser Because you will get 20$ clicks free! Grab this offer to test your first ClickBank Product. Yes, this is like a storm of digital products, you need to just choose a product according to your requirement and promote. Here is some thing important for you, don't promote a product which is having Gravity less than 50. Well, very good reasons are it is having more than 10,000 digital products as well as more than 100,000 people promoting those products, now think about the ClickBank. For attracting more affiliates to their product they do provide tools just like banners for promoting their product. You will get this from the description of their product on the marketplace only. This is really need to make more money as an affiliates because your blog or website is not good enough to make more money from blog. 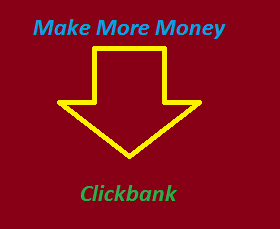 You have to promote Clickbank product on other blogs or website to make ton of dollars from the internet. If you are having any problem, no matter any where ask me I will definitely give you answer, well in this blog post I hope you got lot of points to promote ClickBank products, well one more suggestion I would like to share with you for getting more sells. Create videos as well as write a review article about the product then link that article with the banner ads that's why your readers will get inside view of the product. But for making more money from ClickBank its always depend on you, I mean choosing product to promote is always make you win, I have very simple solution for it, always choose evergreen product like earn money online as well as health related product, those convert really well. Is there anything else would you like to know about Clickbank? Great posts in your blog regarding Clickbank. Make a full time online earner in CB.